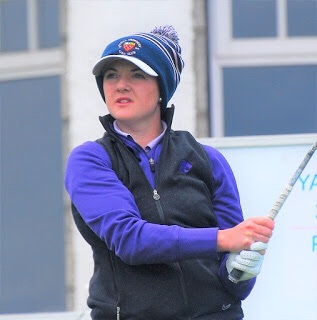 Scottish women's amateur champion Connie Jaffrey from Kilwinning, a student at Kansas State University, finished joint 23rd in a field of 63 competitors at the Magnolia Invitational women's college tournament at Old Waverly Golf Club, West Point, Mississippi. Connie, (pictured above)on her way to the Scottish title at Royal Aberdeen GC in the spring, had rounds of 72, 75 and 75 for a six-over-par total of 222 over a 6,320yd course at Old Waverly. Kansas State team-mates, Chloe Weir from Belfast, and freshman Niamh McSherry, also from Northern Ireland, finished T37 and T41 respectively. Chloe had scores of 81, 74 and 72 for 227 while Niamh shot 72, 79 and 78 for 229. Julie Johnson (Ole Miss) (68-69-72) and Abby Herrman (Memphis) (70-70-73) tied for first place on 209 after which freshman Julie won a sudden-death play-off at the second extra hole. Abby was one of three Memphis players in the top four finishers but Ole Miss (854) won the team title ahead of Memphis (861) with Tennessee (873) third and Kansas State (898) ninth of 10.